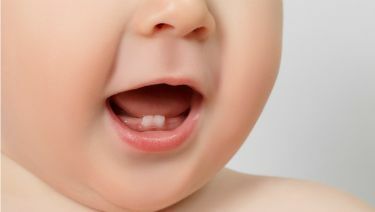 Your baby's first tooth probably will appear after six months, though some babies are born with one or more teeth and in other cases teeth don't appear until the child is almost a year old. Many mothers decide that it's time to stop breastfeeding when they first notice a tooth. Usually this is because the baby has nipped the breast at the end of a feeding session or because the mother fears she will be bitten. Yet many babies with teeth (or those who are teething) never bite when breastfeeding. Did You Know: An actively nursing baby will not bite, because her tongue covers her lower teeth. A baby who nips the breast as he starts to pull away near the end of a feeding can be taught to stop. Try not to let this minor challenge get in the way of breastfeeding so early in your nursing relationship. If your baby has sprouted a tooth and you are concerned that she may nip you as a feeding ends: Keep your finger ready to break the suction and remove your breast as soon as her rhythmic suckling stops (and before she starts to drift off or feel playful). Once your baby's teeth have begun to come in, it is important to keep in mind that even breastfeeding babies are sometimes susceptible to baby-bottle tooth decay (BBTD), a major cause of dental cavities in infants that can also cause serious damage to permanent teeth later on. 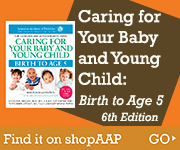 BBTD results from teeth being coated in almost any liquid other than water for long periods, and occurs most commonly among babies who are put to bed with a bottle of formula or juice. Research shows that human milk by itself does not promote tooth decay. But breastfeeding infants who fall asleep while nursing with unswallowed milk in their mouths are also vulnerable to tooth decay. Beyond the first year, dental caries—tooth decay—can occur in toddlers who receive sugary liquids in a bottle or who are nursing and eating foods with sugar and carbohydrates. Make a point of removing your breast from your baby's mouth once she has fallen asleep. Your pediatrician will check your baby's teeth as part of the well-child visits during the first year of life and beyond. To stimulate healthy gums and good oral hygiene: Wipe the gums at least once a day, beginning at birth, even before any teeth have erupted in your child's mouth. After teeth erupt: Wiping her gums and teeth with a piece of gauze or a damp cloth after feedings and before bedtime will help maintain good oral hygiene. Once you are able brushing: Start using a smear (grain of rice sized) amount of fluoridated toothpaste and a soft bristled, child-sized toothbrush for daily cleaning (two times per day). Fluoride is an important way to protect your child's teeth from cavities. Your pediatrician or dentist can help guide you on the optimal amount of fluoride for your child. It is important to use fluoridated toothpaste in the appropriate amounts for age, drink water with fluoride (most tap water), and have your child's pediatrician or dentist apply fluoride varnish as needed. Try to take your baby to the dentist by age 1: You can form a relationship with your dentist to help keep your baby's mouth healthy.